Some models of the Samsung Galaxy S7 and Galaxy S7 edge came with Dual SIM capabilities. This was offered in the form of a hybrid SIM tray (pictured above) that allowed users to employ the second SIM card holder for a microSD card instead. In 2016, the Dual SIM variation using the hybrid SIM tray was available in the Middle East, Asia and Africa. Last year, the hybrid SIM tray was again offered in select markets on the Samsung Galaxy S8 and Samsung Galaxy S8+. What about this year? Thanks to Samsung Germany's early posting of its support page for the Samsung Galaxy S9, we can tell you that the Dual SIM feature will apparently be offered in Europe this year. We come to that conclusion because of the two model numbers listed on the German site, which are SM-G960F/DS. 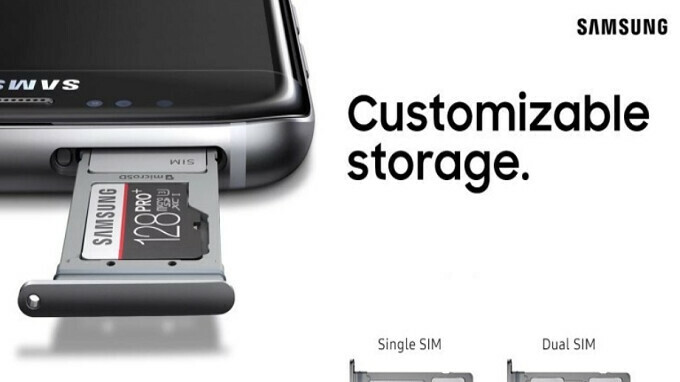 The "F" designation following the SM-G960 indicates the international version of the Galaxy S9, while the model with the "DS" at the end of the name indicates that it is a version of the phone with Dual SIM capabilities. Since the Dual SIM designation appears on Samsung Germany's website, it isn't a huge leap of faith to assume that the European consumer will be able to purchase a variant of the Galaxy S9 or Galaxy S9+ that comes with a hybrid SIM tray. As we pointed out in the first paragraph, the latter will accommodate two SIM cards or one SIM card and one MicroSD card. China is another market expected to receive the Dual SIM version of Samsung's 2018 flagship models. The Samsung Galaxy S9 and Samsung Galaxy S9+ will be unveiled on February 25th, and are expected to launch on March 16th. I other news the honor 7x seems to be sold out on Amazon. In other news it's a lag fest of a phone. From what I've read. In other news I have heard that you are a professional hater. Why can't we get dual micro sd? Galaxy S8 S8+ and Note8 already available with dual sim in Germany !!! What is the new now ? ?